How to Have the BEST Night Out On the Town in Just 4 Easy Steps! You want time to celebrate with friends and party your hats off and you want something unique... you want the perfect night out that will be remembered! It's time for you and your friends to take the limits off and go downtown in STYLE. 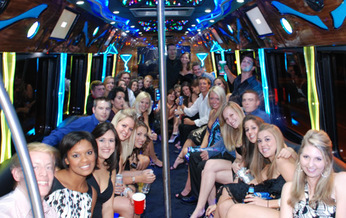 At St. Catharines Limousines we have the perfect solution for you and your friends: a party bus stretch limousine! It is the perfect vehicle to experience downtown like never before. Call up your best friends and start brainstorming some ideas of where to go downtown. What route should you to take? What places to visit? What scenery to go after? Maybe you’d like to go to that nice new restaurant, the jazz club, and then have fun at the nightclub scene. Whatever route you take, make sure you plan it in advance and share it with our staff, and our chauffeur will take you there! Define that special night with a purpose in mind to make it extra special. Plan it around someone's birthday, or a special holiday like Valentine's Day or your anniversary. The possibilities are endless when you have all the details of your night planned and booked in advance. Perhaps make it more of an adventure theme like a treasure hunt, geocaching or bar hopping, which adds a special twist to your night out, where everyone is enjoying themselves and collaborating together for a specific goal. It just makes it that much more fun! St. Catharines chauffeurs can offer great ideas for that unique night, as well! 3) Prepare your music and drinks so you're ready to party! In order to have the best experience downtown, make sure you give us a list of your music and drinks that you’d like for us to have prepared inside our Party Bus On-board Bar! We have drinks ranging from non-alcoholic to champagne, whiskey and more! Make sure everyone is age appropriate, and enjoy your limousine with fun interior lighting, dancing poles, premium sound systems and even a smoke machine for added effects. You’re going to have a BLAST! 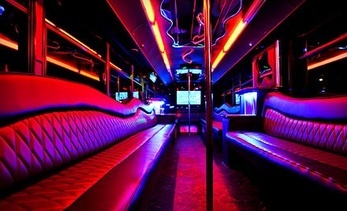 4) Book your limo or party bus with us tonight! When you've got the experience of a lifetime literally at your fingertips, why not book your special night out on the town with us today. Call us at 289-768-6269 and a representative from St. Catharines Limousines will get in contact with you to help you plan your epic night right away. 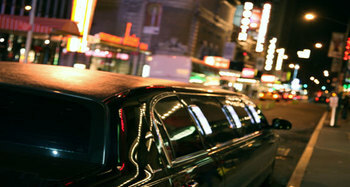 Our limos are the very best that St. Catharines has to offer. All of our drivers are world class, experienced and trained. They know how to make your night on the town a special one for you and your friends!